Baldness is a condition when the hair either falls or recedes in such a way that the scalp is visible. It is a deeply distressing and embarrassing situation that affects the self esteem of people, endurance and shrinks their daily life activities. 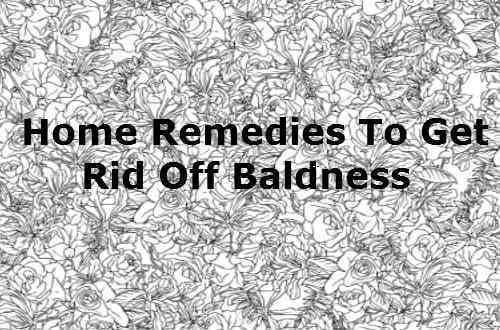 Baldness usually occurs in areas of temple, forehead and at the top of the head. Some people are characterized by baldness at all areas of the head while some get affected at any one area of the head. Women too get affected by baldness. It only appears as little patches at some places and also in thinning of hair. Though most women go completely bald, it is not very common. Throughout the ages, people have associated with various factors like wisdom, aging, esteem and a lot more. Even religions have played customary role in associating baldness with it. Baldness can be prevented but cannot be reversed when it occurs. Several companies utilize baldness and fool the public by showing commercial advertisements that their products can make hair grow on the bald head. Coconut oil and coconut milk is an effective natural remedy to treat hair loss. Massaging the scalp of the head with a little quantity of coconut oil or amla helps in the circulation of blood to the scalp area. It helps in fighting against split ends, dandruff and also clears pores on the skins. After leaving it as such on the scalp for half an hour, we must wash our hair with shampoo. Repeating it twice or thrice a week will enable the growth of hair in the bald areas. Not only coconut oil, any oil like almond oil, mustard oil and castor oil can be used for the massage. It provides the same benefits as coconut oil. We must boil the seeds in coconut oil. After it cools, we must filter it and apply the strained oil on the scalp in a way it reaches the hair roots. This makes the roots to become strong and stops shredding of hair. Henna has been used in the treatment of hair since ancient times in India. It provides multifold benefits like coloring, providing nutrients like proteins to the hair and fights any fungal and dandruff infections. Henna leaves are boiled with castor oil and filtered after they are cooled. The filtered oil is then massaged on the scalp for obtaining the variety of health benefits it possess. Half a cup of curd is mixed with a paste of gram flour. Likewise white of egg can also be used instead of gram paste. This mixture when applied thrice every week before bath can help to reduce the balding. Two teaspoons each of olive oil and honey are mixed together. Any spice can be also added to it. Cinnamon is the best spice to add to it. This mixture can then be applied on the affected area and allow it to remain so for about quarter of an hour. Practising twice or thrice a week can relieve the problems of balding. Onions are effective in treating baldness. Cut an onion into two pieces and massage it on the patchy bald area. Massage it gently till the area becomes red. After that apply honey on it. Do it thrice a week to see the desired outcome. We must heat amla in coconut oil. After filtering it we must directly apply the filtered oil on the bald head. We must let it for a quarter of an hour and then take bath. Similarly we must mix the juices of both lime and amla. Applying on the head prior to bath can help to reduce the balding. The juices of both lettuce and spinach must be mixed together and applied on the bald area. After some time, that is, say a quarter of an hour wash the hair thoroughly. Repeat this thrice every week to enhance the health of the hair in all the desired ways. We must crush the seeds of both lemon and pepper. Adding a little water can result in the formation of paste. Applying on the bald area twice a day results in stimulation of blood circulation and healthy growth of hair. Applying blended egg on the bald area can result in the growth of hair in those areas. Eggs can also be mixed with olive oil to quicken the desired effects. Guava leaves are boiled in a cup of water. After it cools down filter it and apply the resulting water solution and let it aside for about quarter of an hour. After that rinse the hair thoroughly. Make it a practise to do it thrice a week. The herbs rosemary and sage are either boiled together in water or separately in water. Similarly after they have cooled down we must filter them. Applying them on the head prior to taking bath will result in the better development of hair. Rinsing hair with neem water results in the prevention of greying of hair, removes fungal infections and aids hair to grow on the bald area. Unlike other remedies needs to be consumed as a drink. It is rich in protein, vitamins, iron and other essential nutrients. When mixed with aloe vera it cures all types of hair problems. The mucous secreted by the hair roots is a complex substance. It has to be in moderation. Excess and low secretion of it results in hair loss. Sometimes excess of it gets stored on the head. It can be removed by mixing mustard oil and baking soda with shampoo. Rinse it nicely during bath and repeat it thrice a week to get the desired effects.